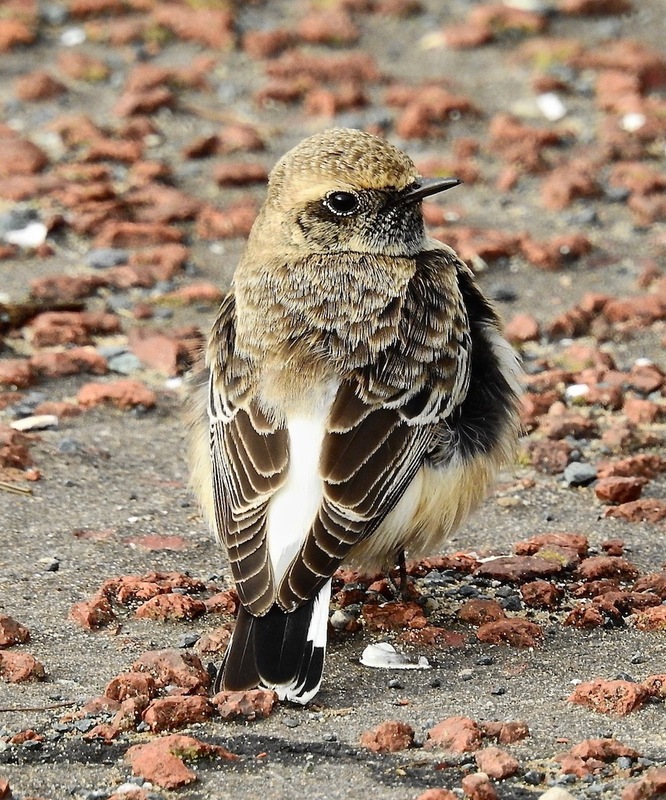 Mixed feelings after witnessing the Pied Wheatear’s enforced diet at Meols, even if it was a fun morning. I’d coaxed two of the more senior members of the old unit out from under their tartan rugs today, eliminated Pied Wagtail as a confusion species and reassured ’em that even though we were going over the water, we were actually driving under it…. 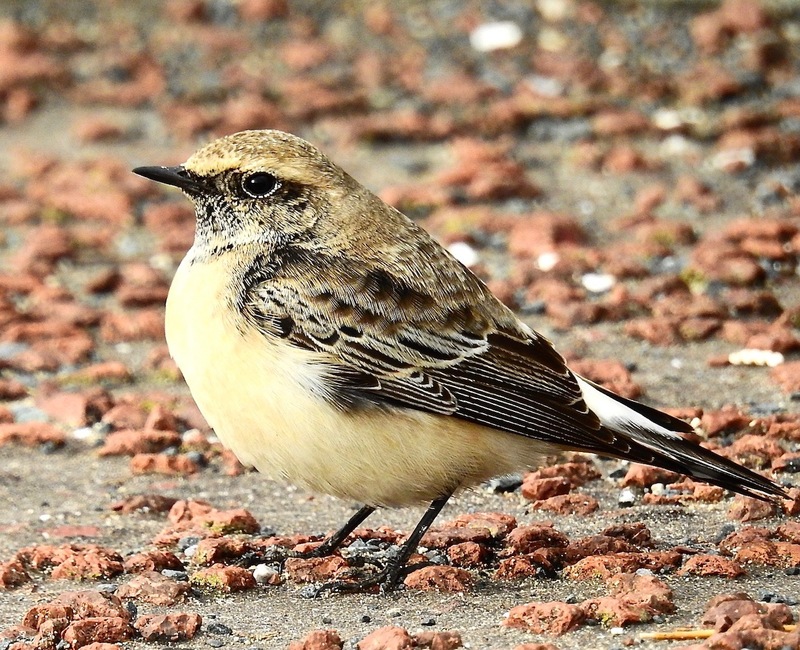 When I pulled up on the Wirral a semi-circle of 50-odd folk were staring at an empty pavement, but about ten minutes later the Pied Wheatear materialised on the seawall, then dropped down to feed at our feet – on mealworms. 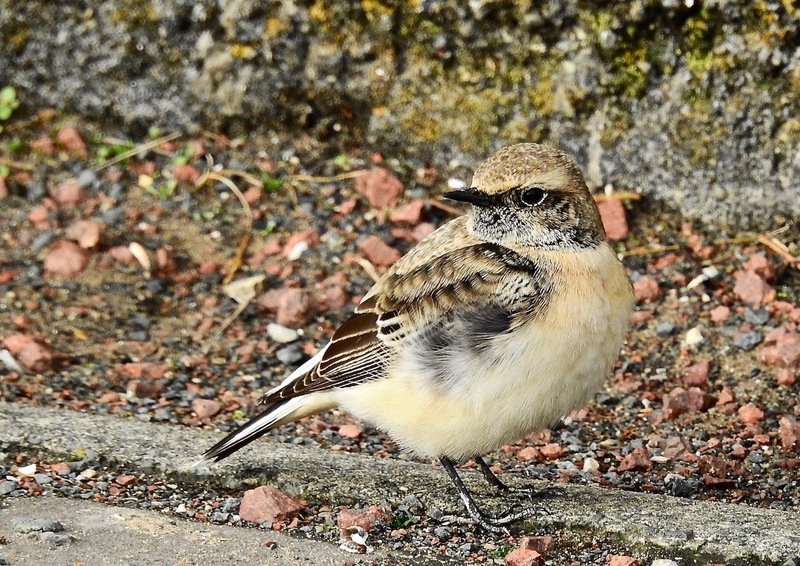 The things seem to be used everywhere now – the wheatear was occasionally gagging (how many mealworms can one Pied Wheatear eat?) just like the Stinky Pink did in St Helens before it was totally sprawked. Was the starling a sitting duck as it was drawn to the top of the alley wall by a pile of the wrigglers dumped there? 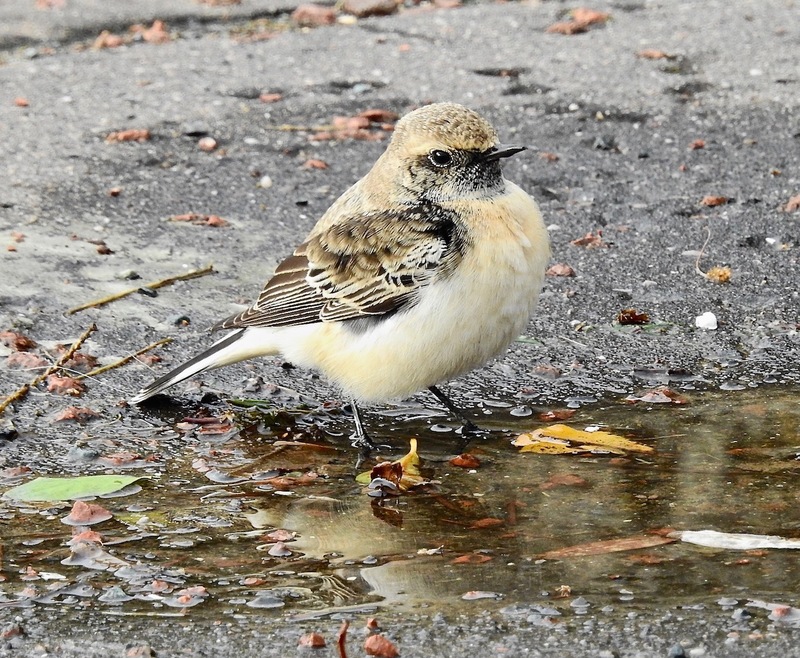 I wasn’t surprised when the wheatear started to drink from a puddle at our feet, the bird looked so plump it needed something to wash the mealworms down with. It was so full it had to take a deep breath every time it tried to flick back up onto the seawall. 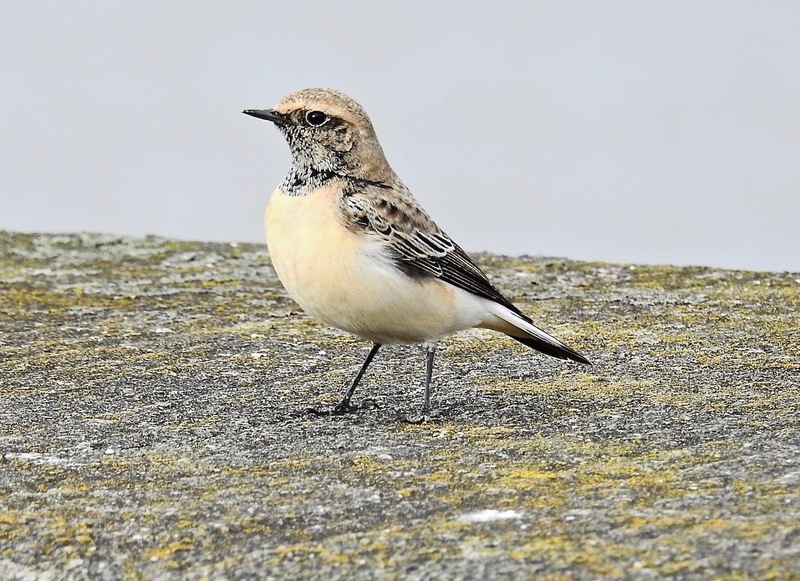 It all felt a bit crap to be honest – I certainly enjoyed seeing the rare so close and it has been a long while since my last encounter with Pied Wheatear, and I understand folk want to take pictures (even if they are all the same as everyone else’s), but do you really need to bait a bird that was apparently very approachable in the first place? I’m not a photographer – any halfwit can get images like these with a point and press when a bird is this close – but sometimes a twitch just doesn’t feel much like birding anymore. 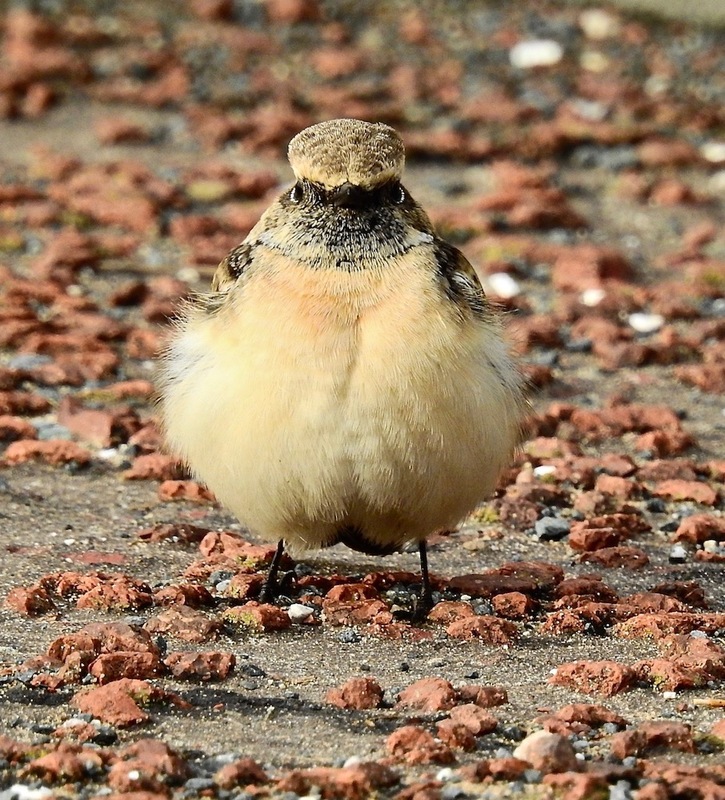 It could of course be argued that twitching isn’t the same thing as birding anyway, but that’s a whole new can of mealworms. 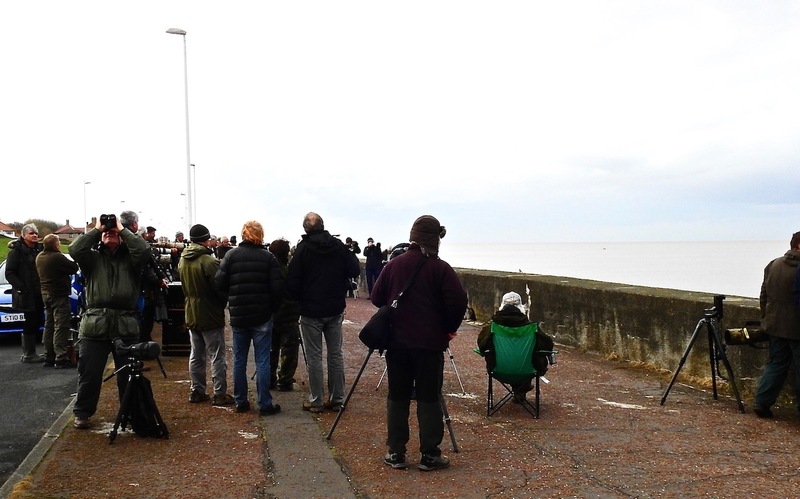 One scan around the crowd revealed 48 people taking photographs of the bird and just one watching it through bins. Thing is though, the garden at Dempsey Towers is filled with fatballs, sunflower hearts, nyger seed, peanuts etc etc so is this artificial feeding just as perilous to passing passerines if predators take advantage? So what’s the problem with baiting a rare? For me its probably about altering a bird’s behaviour just to get a photograph, which is not really the same thing as feeding birds in a garden. Is it more to do with the changing nature of birding now? Why do images on social media seem as important as being able to actually separate first winter Black Eared and Pied Wheatears…? I once fed a spicy sausage to a Siberian Jay up on Valtavaara Ridge – was that wrong? Let he or she who is without sin cast the first mealworm. A new collection of poems inspired by some of the UK’s most popular birds was launched at RSPB Leighton Moss nature reserve in Silverdale on Friday 16 November. When publisher Rebecca Bilkau had a chance encounter with a lapwing, little did she know where that brief moment would take her. Keen to learn more about this iconic bird of farmland and shore, she soon discovered that this once common wader is now in serious decline and placed on the Red List of endangered UK birds. As Rebecca delved deeper, the more horrified she became, learning that many of our most treasured and familiar birds can be found on this list: Red is the highest conservation priority, with species needing urgent action. In an effort to highlight the plight of our troubled birdlife, Rebecca contacted multiple poets from around the country with a plea that each should choose one bird from the list and write an exclusive poem to celebrate that individual species. Accompanied by specially commissioned illustrations, the book features all 67 birds on the Red List as well one which will never return, the sadly extinct great auk. As well as helping to raise awareness of the issues surrounding our declining wildlife all profits raised from sales of the book, titled ‘Watch The Birdie (While You Can)’, will be donated to the RSPB. Published by Beautiful Dragons, the book will be available from the RSPB’s shop at Leighton Moss and other local outlets. Rebecca Bilkau of publishers Beautiful Dragons said: “I was appalled to discover the Red List. I couldn’t believe that some of our most familiar birds were now considered endangered species. What? Song thrushes. Herring gulls. Sparrows (tree and house). Sparrows? We decided we wanted to do something to help draw attention to the situation and to support the RSPB”.